Written by Afsheen Sharifzadeh, a graduate of Tufts University focusing on Iran and the Caucasus. The goal of this article is to familiarize the reader with the looks and feels of Circassia, its people and language in a historical and modern setting. 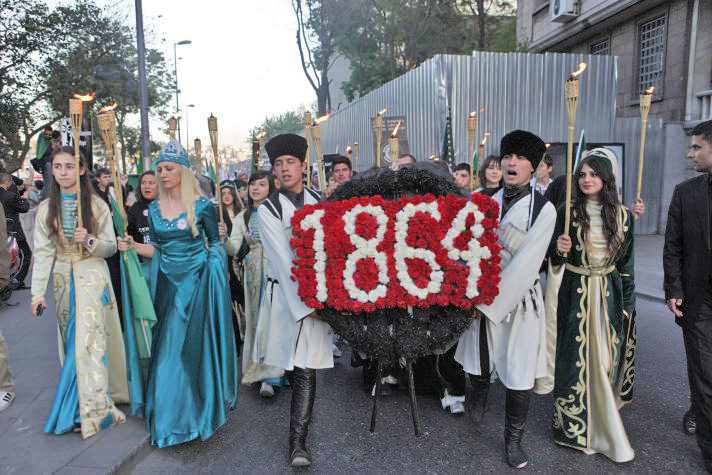 Descendants of Circassian deportees in Istanbul, Turkey (2011) commemorate the banishment of their ancestors from their homeland in the Northwest Caucasus by Imperial Russia in 1864. By an irony of history, the 2014 Olympic games marked the 150th anniversary of the Russian defeat of the Circassians in 1864, and therein the annihilation of a civilization whose last independent capital, Sochi, rested at the center of a polity stretching from the Sea of Azov to the gates of North Ossetia-Alania. After the Georgians and the Armenians, the Circassians came closest of all the Caucasian peoples to developing the prerequisites for nationhood. But their efforts were cut short by the Russian Empire’s merciless onslaught and translocation of ninety percent of their population to Anatolia and the Near East in the early 1800s—nearly half a century before the Armenian Genocide in the Ottoman Empire. As a share of total population, the Circassian diaspora is the largest in the world, a fact that is underscored by nearly seven centuries of foreign slaving expeditions which kept the Circassian core volatile and precluded the establishment of large permanent settlements around which an urban society could evolve. In addition to the psychological and economic repercussions of en masse deportation, forced population translocation on this scale can have dire consequences for the continuity of a people and culture. This article aims to better characterize the Circassians and promote understanding of their culture and language, in an effort, however modest, to keep this vibrant chapter of humanity alive and prolific. Circassian does not refer to a single language inasmuch as it refers to an overarching sprachbund of dialects associated with pastoralist tribes inhabiting the riverbeds of the northwestern Caucasian piedmont, which together exhibit varying degrees of mutual intelligibility (although this remains poorly characterized). The main typological split is between two literary standards that were first written in a modified Perso-Arabic script, followed by Latin and later Cyrillic: Adyghe (Western Circassian, Lower Circassian) and Kabardian (Eastern Circassian, Upper Circassian), which, taken with the Middle Eastern diaspora, compose a speaking community of around 2 million individuals today. Each tribe and clan has its own distinct dialect—the Shapsug, Natukhai, Besleney, Cherkess, Abadzekh, Zhane, among others—but all invariably refer to themselves as Адыгэ (Adyghe) and to their language as Адыгэбзэ (Adyghäbze). A Circassian dance group performing a tale from the Nart Saga according to the “Qafe” dance repertoire. The Nart saga is shared among the folklore of the Adygheans, Cherkess, Kabardians, Abkhaz, Abaza, Chechens, Ingush, and Ossetians in the North Caucasus. 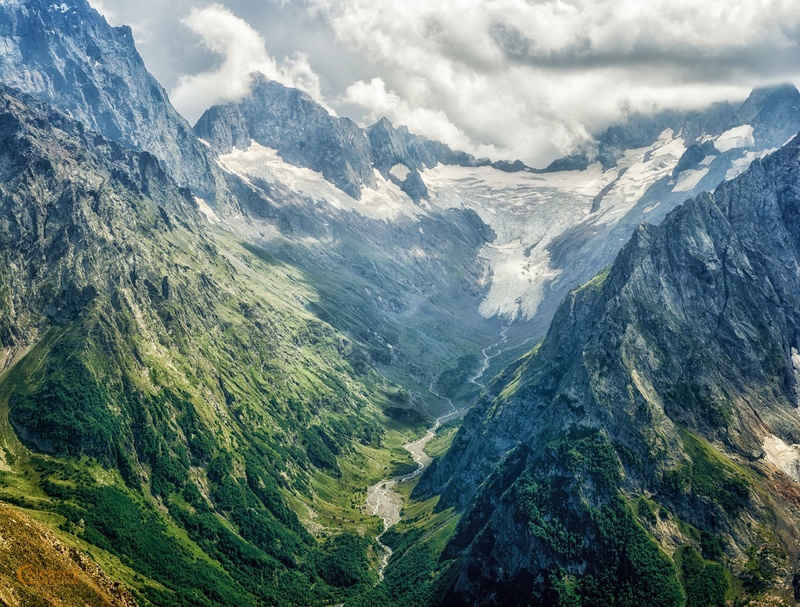 A glacier and valley in Karachay-Cherkessia, Russian Federation. The alpine terrain of historical Circassia impeded contact between the various Northwest Caucasian languages and dialectically distinct groups for thousands of years. It remains unclear when and wherefrom the speakers of Proto-Northwest-Caucasian arrived in historical Circassia, as this language family cannot be linked genetically to any other attested macrofamily on the Eurasian landmass even at the magnitude of 15,000 years (save a few moderately convincing attempts at a remote link with Northeast Caucasian, but remains by no means clear). Together with Abkhazian, Abaza, and Ubykh (extinct in 1992), Circassian belongs to a rare linguistic macrofamily, Northwest Caucasian (NWC), to which there are no known relatives elsewhere on Earth. These unique languages share a common ancestor, the hypothesized Proto-Northwest-Caucasian language, whose speaking community underwent splitting events some six thousand years ago, after which the daughter languages differentiated in close geographic proximity but remarkable isolation from each other for many thousands of years to the present. It is not difficult to suppose a paradigm in which contact between NWC languages and other groups was impeded by the difficulty of communication and travel from one canyon to the next (the main passes through the Caucasus are located at the central and eastern part, explaining why Circassian is comparatively free from foreign influences), as well as the mere toils of life in the valleys of the North Caucasus. Any genetic link between NWC and other macrofamilies in Eurasia remains excruciatingly dubious if not outright nonexistent, such that the family is never included in the Nostratic Hypothesis, which postulates an exquisitely remote common ancestral tongue to Indo-European, Uralic, Afroasiatic, Altaic, Kartvelian and Dravidian spoken by bands of foragers near the end of the last glacial period nearly 15,000 years ago. In general the NWC languages feature rich consonantal systems and a paucity of vowel phonemes. Notably, with around 80 consonants and only two phonemically distinct vowels, the Ubykh language featured one of the largest inventories of consonants in the world. Un court documentaire sur Tevfik Esenc, l’ultime locuteur natif de Ubykh, une langue qu’il a appris à maîtriser de ses grand-parents—eux-mêmes déportés du Caucase pendant le Génocide Circassien. Il est mort en Turquie en 1992, et avec lui, la langue Ubykh. Ubykh comme une langue Abkhazo-Adygienne était liée à la langue Abkhazienne et plus lointainement à la langue Circassienne, bien que les deux proto-langues ont divergées il y a environ 5 mil ans. The Pre-Hittite, non-Indo-European language of Anatolia, known as Hattic, is now widely believed to be a remote relative of Proto-Northwest-Caucasian, perhaps becoming established there as a result of migration from Transcaucasia some time predating six thousand years ago. Beginning in the 4th millennium BCE the Hattic language was gradually displaced by archaic Indo-European languages, most likely Luwian and Hittite, and the Hattians were ultimately absorbed and assimilated into Indo-European-speaking society after nearly two thousand years of coexistence by the end of the 2nd millennium BCE. However, the latter adopted the former’s self-designation (<Hatti; which in the opinion of this author, is likely also the root of the Armenian self-designation Հայ Hay). 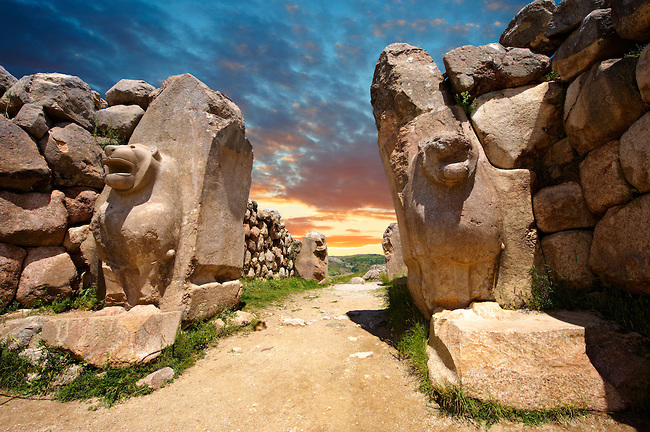 The Lion Gates at the ruins of Hattusha, Turkey. Hattusha was once the capital city of the Hattians, who are now believed to be remote relatives of Northwest Caucasian peoples. Their language was probably a cousin of Proto-NWC, but was eventually displaced by the advent of archaic Proto-Indo-European speakers and the diffusion of the Luwian, Palaic and Hittite languages. Due to the sheer frequency of foreign invasions, raids, slaving expeditions, and internecine warfare, the Circassians emerged as a semi-nomadic pastoralist people whose primary administrative unit, the hamlet (aul), was necessarily constructed hastily and with little care only to be abandoned at a moment’s notice. Nevertheless, individuals auls generally maintained a stable and fairly sizable population in spite of their mobile nature. Circassians rarely built fortified villages with stone towers in the style of the Eastern Caucasians (Chechens, Ingush, and Daghestani peoples), as defensive structures were considered signs of weakness according to the age-old code of chivalry. Instead, they lived in isolated farmsteads surrounded by orchards and groves of walnut trees. In periods of external danger, clusters of forty to sixty houses were constructed in the form of a circle or square with only one gate for ingress and egress. The Circassian dance repertoire is sizable and viewed as a core social custom, even in light of the arrival of Islam in the 19th century (except for the Middle Eastern diaspora, which is currently trying to revive this custom). Initially a pagan religious rite, the custom transformed from a kind of spirited prayer into a form of festive ceremony (“Zhegw”) and display of martial fitness and grace devoid of religious meaning. The “Wij” and “Zef’ak’we” dances are performed by couples going through ancient ritual motions. “Qafe” is a stately slow dance, probably of princely provenance, performed with pride touching on aloofness and with a great measure of self-control, while “Yislhemey” is energetic and can feature dizzying footwork. Circassians placed enormous value in practicing what were considered dignified customs and style of life, and paid great attention to cultivating their beauty in the form of rigorous training regimens and use of growth-arresting artifices during the formative years. As per custom, Circassians wore elegantly embroidered costumes (tsey) tied at the waist with a belt (s’ch’i’wbgirpx) designed to highlight their slender, V-shaped and symmetrical body physique according to prevalent ideals. The pervasive code of etqiuette, adat, was an unwritten compendium of laws and responsibilities that bound the genders, classes, and tribes together in some form of feudal harmony in the otherwise glaring absence of centralized authority and hard currency. For example, we can imagine that the sacrosanct nature of the guest developed as a means of assuring safe travel in a perilous terrain otherwise devoid of policing or any formal semblance of civil order. The threat of blood revenge, which often escalated into generations-long feuds, was an attempt to deter murder by threat of sure retaliation against the killer’s entire bloodline. The social structure of Circassian society was highly complex and based on hierarchical feudalism, except for a few egalitarian tribes. The coexistence of two opposing tribal paradigms in Circassia—feudal and democratic—is unusual and reflective of a fragmented perception of ethnic continuity among dialectically distinct groups, at least at an early stage. Each feudal tribe was divided into princedoms (Pshi), which were effectively independent, although there was a council of princes (Khase), which met at times of national crises. At the apex of each principality stood the Prince (Pshi-t’khamade) who wielded almost absolute power over his subjects. Land and serfs were owned collectively. Of note, the Circassian clan was not divided into nuclear families but rather into extended households consisting of a father and his married sons (Winezëxës). Thus, inheritance was not devolved from father to son but rather from brother to brother. Avoidance customs entailed the prohibition of fraternizing of siblings in private and public. If a person approached a group of people and he saw one of his brothers in the group, then, according to seniority of age, he either walked away from the group, or joined it, whilst the junior bid his leave. This custom was sanctioned to lessen sibling rivalry. Conference of Circassian Princes (called Khase) in 1839. Next to the prince came the nobles (tlfoqotl’), who were divided into the proper and lesser nobility, and the vassals who were given a free hand in their fiefdoms in return for their allegiance. A peculiar custom, the atalyk, whereby the children of the princes were entrusted at an early age to the vassals to be raised and trained in a military fashion, played a pivotal role in strengthening the relationship between the prince and his nobles. Below the nobility came the freemen and free peasants, then the bond peasants and finally the slaves and villeins who performed the menial tasks and were mainly war captives in stock. The behavioral and social norms of adat were regulated by an orally transmitted codex called Adygha Khabze, or “Circassian Etiquette”, which was exceptionally rigid and complex and its contravention was severely punished. It had evolved to ensure that strict militaristic discipline was maintained at all times to defend the region against the many invaders who coveted Circassian lands and human capital. The Lezginka dance among Circassians in Nalchik, Kabardino-Balkar Republic, Russian Federation. This dance repertoire originated with the Lezgin people of Daghestan, but is now shared by the peoples of the North Caucasus. Toward the end of the 11th century, Genoese colonies began to appear in rapid succession along the Black Sea coast in which Italians, Tatars, Circassians, Abkhazians, Armenians, Greeks, Georgians, Jews and Slavs lived and engaged in extensive trade. The center of the Genoese community was Caffa (modern Feodosia, Crimea), which at its height had a library, school, and other municipal services, although it remains unclear which group’s language served as the lingua franca of these settlements. The city-states of Matrega, Mara and Kopa were jointly ruled by Circassian and Genoese sovereigns, and in the mid-fiftheenth century Matrega was ruled by Prince Zakkaria Gizolfi, the son of Vincenzo di Gizolfi and a Circassian princess. It thus followed that for a period of nearly 700 years, the pressures imposed by the slave trade impeded any prospect for the development of Circassian society. First, the sheer number of able young men and women removed from the local population crippled population growth, and constant raids by the Genoese, Mongol and Tatar slave expeditions created an atmosphere of perpetual warfare in the region. This precluded the establishment of large permanent settlements around which an urban society could evolve. Instead, the Circassians emerged as a mobile, militaristic civilization, which, in contrast to the mercantile societies of the Black Sea coast, isolated themselves in the valleys of Transcaucasia, viewed outsiders with suspicion and equated defeat with slavery. Tsar Ivan IV “The Terrible” (left) and his Circassian wife, Maria Temryukovna (right; née Kuchenei). In 1557 the Russian-Kabardian treaty was formalized between the Kabarda tribe and the Tsar. The Kabardian Prince Temryuk Indarko sent his sent his son to Moscow, where the latter adopted Christianity and became and influential boyar. Three years later, relations grew closer and Temryuk married his daughter Kuchenei to Tsar Ivan IV. The Genoese vigorously traded slaves from the North Caucasus to markets throughout the Middle East and particularly Egypt. When the Egyptian Fatimid dynasty formed a military caste known as the Mamluk Guards around 1200 A.D., the slave trade in Crimea and the Northwest Caucasus accelerated as the Genoese exploited the new demand for young men. Interestingly, in the 14th century a Circassian Mamluk slave named Barquq founded the Mamluk Burji dynasty in Egypt, which remained in power until the Ottoman Empire’s annexation of the realm in 1517. 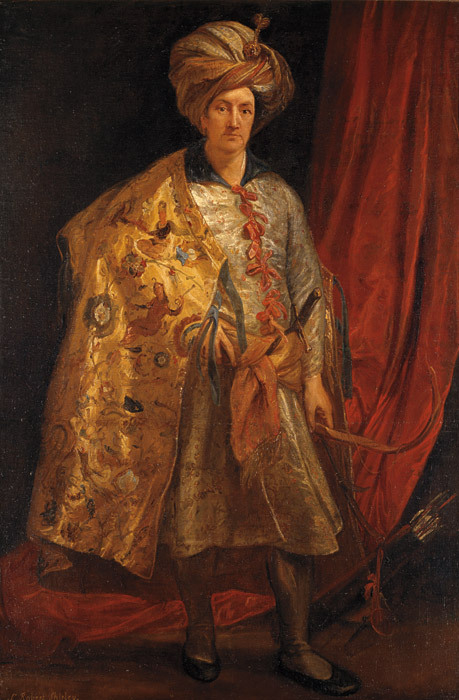 Meanwhile in Persia, the Safavid monarchs institutionalized a scheme whereby young Circassian, Georgian, and Armenian men were kidnapped, converted to Islam, and trained as royal pages (Ghulaman-i Khassa or Qapi Qullari) in an effort to generate a new courtly caste unconditionally bound to the Shah and one therefore capable of undermining the power of the Turkic Qizilbash nobility. 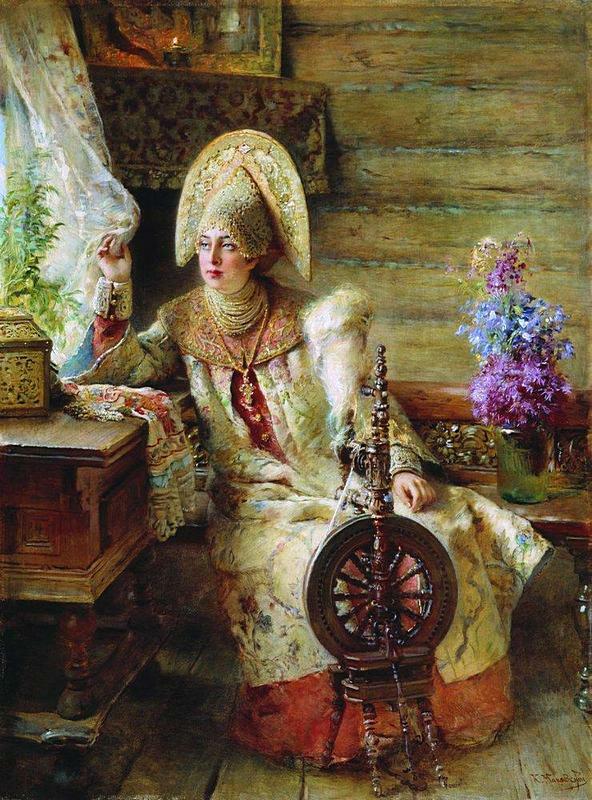 Circassian women were likewise exploited for their renowned beauty (“Circassian beauties”) in the royal harems of both the Ottoman Empire and Persia, where they competed ferociously to promote their own sons to the throne. A notably clever Circassian princess, Pari-Khan Khanum, became an influential figure in the Safavid court in Persia, and she even acted as a king-maker in two instances in the middle of the 16th century. Having detested the Georgian mother of Haydar Mirza, who had been a favorite son of Shah Tahmasp and regarded as heir apparent, she plotted a coup in which she gave the keys of the royal palace to her maternal uncle, who then immediately filled it with 300 Circassians tasked with murdering Haydar Mirza. 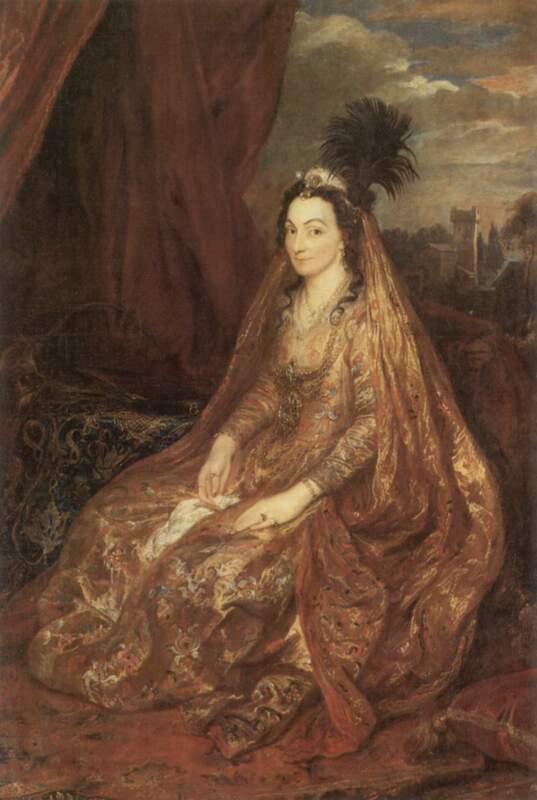 Shah Abbas II’s Circassian mother, Anna Khanum, received revenue and Christmas gifts from the most opulent sector of Isfahan— the Armenian suburb of New Julfa. Shah Abbas II (1632-1666) was the seventh Shah of the Safavid dynasty in Persia. He was the eldest son of Shah Safi I and a Circassian, Anna Khanum. Even before their final victory over the Circassians in 1864, the Russian government had decided to deport the majority to the Ottoman Empire and settle their land with Slavic-speaking Cossacks. 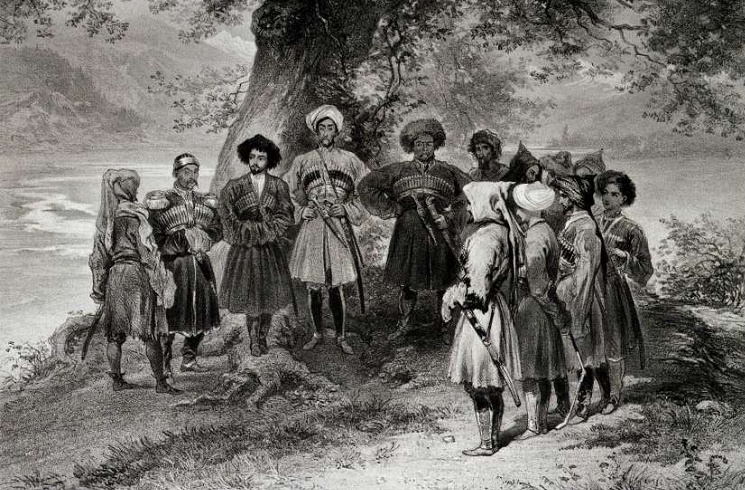 As Russian General Rostislav Fadeev noted, re-educating the Circassians so that they might “live correctly” was too slow a process, so the Russian chose to eliminate them. The Abadzekhs, Shapsugs and Ubykhs, still naively expecting international assistance after consistent failures on the part of Western European powers to recognize an independent Circassia, desperately petitioned to the Russian general in Tiflis to spare their annihilation in exchange for accepting Russian suzerainty—but to no avail. The mass deportation of various Northwest Caucasian peoples into the Ottoman Empire, following the defeat of the Circassians by Imperial Russia in 1864. The actual deportation was conducted with no concern for the welfare of the deportees. According to Fadeev, the needs of the Russian state superseded any humanitarian concerns and necessitated the elimination of the Circassians. Starvation and disease raged among those waiting for transport, and ships were overloaded with 400% of their carrying capacity. Once at sea, many ships sank. The number of Circassians, Abazas and Ubykhs displaced could be as high at 1.2 million, although nearly half of them died en route or shortly after arriving in Turkey. Of note, the entire Ubykh nation was expelled from its homeland, which culminated in the death of the Ubykh language roughly a century thereafter. “On the road our eyes were met with a staggering image: corpses of women, children, elderly persons, torn to pieces and half-eaten by dogs; deportees emaciated by hunger and disease, almost too weak to move their legs, collapsing from exhaustion and becoming prey to dogs while still alive….The Turkish skippers, out of greed, overloaded their boats with Circassians they received payment for like cargo to the shores of Asia Minor, and like cargo threw anyone who showed the slightest sign of illness overboard. The waves threw the corpses of these unfortunate souls onto the shores of Anatolia….Scarcely half of those who set out made it to their goal.” –Drozdov, “Posledn’aya Bor’ba s Gorstami na Zapodnom Kavkaze,” Kavkazskii Sbornik, 1877. “The mountaineers leave the aul (village)”, by P.N. Gruzinsky, 1872. What proves problematic in the United Nation’s definition of genocide is the question of “calculation” of destruction. In the case of the Circassians, Abazas and Ubykhs there is no evidence that the intention of the Russian Empire was to destroy them as an ethnic group but rather to rid the empire of their presence. St. Petersburg was uninterested in the fate of the deported peoples but certainly did not wish to annihilate them, as it had the opportunity to kill all the Circassians outright. Judging from documents of the period, Walter Richmond concludes that the Russians would have been equally content if every deported person made it successfully to Anatolia and proceeded to create a new homeland for themselves. On the other hand, there is a conspicuous absence of details of the horrific conditions faced by the deportees in the reports of 1864, written by Commander Yevdokimov and the military personnel involved in the deportation. At the very least, these officials could be considered guilty of genocide as defined under Point (C) of the United Nations Convention, in that their reports could theoretically have caused the administration in St. Petersburg to take steps to minimize the catastrophe. Nevertheless, the deportations could still be viewed not as a genocide but as “a case of ethnic cleansing carried out with brutal disregard for human suffering”, as Stephen D. Shenfield suggests in his analysis of the question. General Veliaminov certainly treated the mountaineers as little more than animals; at one point he offered a reward to his soldiers for the heads of the mountaineers, which he sent to the Department of Anthropology of the Academy of Sciences in St. Petersburg for study. While the case of the Ubykhs presents the strongest evidence for the charge of genocide against the Russian administration, if one applies the U.N. definition it could still be argued that since the Russians did not “intend” to destroy the Ubykhs but simply deport them, this action was not “genocidal” either. 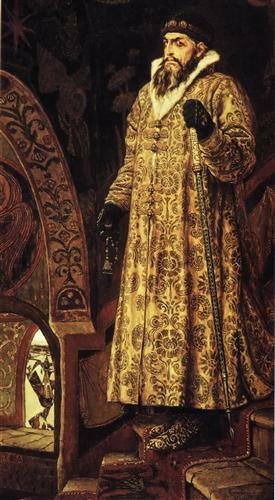 Ultimately, the Russian actions in the 1860s officially sanctioned by Tsar Alexander II set the precedent for future ethnic cleansings, and thus constituted a unique crime against humanity, regardless of what term one wishes to attach to it. 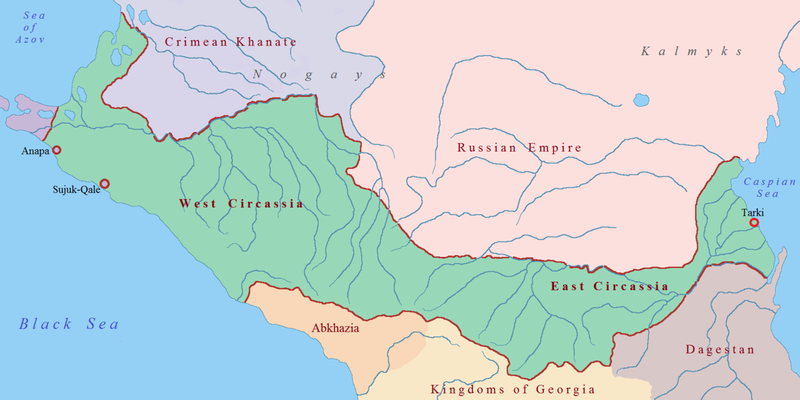 Historical Circassia (Xekwzch “Old Country”), once deprived of the majority of its indigenous population following 1864, underwent a number of land and legal reforms (Raionavanie) under Imperial Russia and later the Bolsheviks. The region emerged as a new home for hundreds of thousands of Cossack (Slavic), German, and Greek immigrants who repopulated the desolate foothills and coast. By 1960 Russians were the majority in the region, but the Soviets had established three autonomous, landlocked enclave republics for the Circassians: Adyghea, Karachaevo-Cherkessia, and Kabardino-Balkar Republic; two of which were dvukhtitul’niy (dual-titled) administrative units in which there was not one but two titular nationalities (*note the Karachay and Balkars are Turkic peoples who were deported en masse to Central Asia by the Soviets and later repatriated themselves via a mass exodus to the North Caucasus. They are unrelated to the autochthonous Northwest Caucasian peoples). 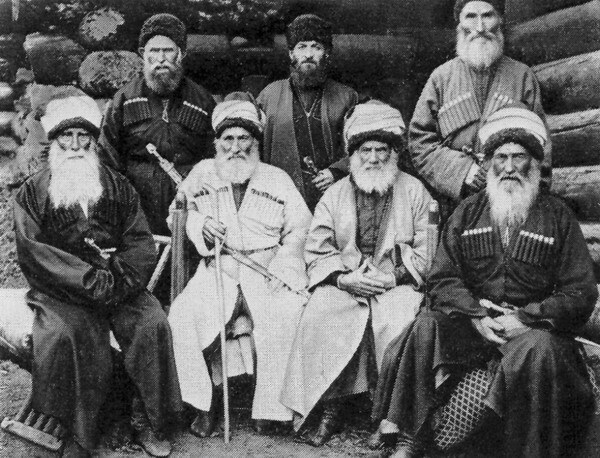 Karachay patriarchs in the 19th century. The Karachay are a Turkic people whose language (belonging to the Kipchak branch of Turkic along with Tatar, Nogai, Kazakh, Kyrgyz, Bashkir and the Karakalpak language of Uzbekistan) is identical to that of the Balkars of neighboring Kabardino-Balkaria and the Kumyks of Daghestan. The Soviets granted the Karachais and Balkars titulary status alongside the Circassians in two of the three autonomous republics carved out of historical Circassia: Karachayevo-Cherkessia and Kabardino-Balkaria. The third republic, Adygea, is only nominally mono-titulary, for Russians and Ukrainians together form a slight majority. This policy served a dual purpose: first, to establish Russian as a lingua franca among traditionally noncompliant communities by exploiting the necessity of inter-ethnic communication, and second to hinder nationalistic ambitions by incurring a state of perpetual competition for limited resources among unrelated groups. Moreover, the Bolsheviks sought to foment intraregional unrest in an effort to deter any hope of solidarity for the Circassian separatists. As a result, relations between the various titular nationalities and other smaller minorities such as the Mongolic Nogais, Slavic Cossacks, Armenians and Abazins quickly assumed an antagonistic character. The present situation remains bleak in the three autonomous republics carved out of historical Circassia in the Russian Federation. Distrustful of one another, ethnic groups vote in blocs based upon nationality rather than issues, and the winners spend their time in pointless conflicts over limited resources. Interview with Sati Kazanova, a Circassian Russian pop star born and raised in Nalchik, Kabardino-Balkar Republic (in Russian). The Circassian diaspora (Sherjes Xexesxer) includes some 4-6 million souls which together display varying degrees of cultural preservation in their host societies. Balkan and Greek Circassians, scattered there at the time of their expulsion from the Caucasus in 1864, have disappeared except for a pocket in Albania. 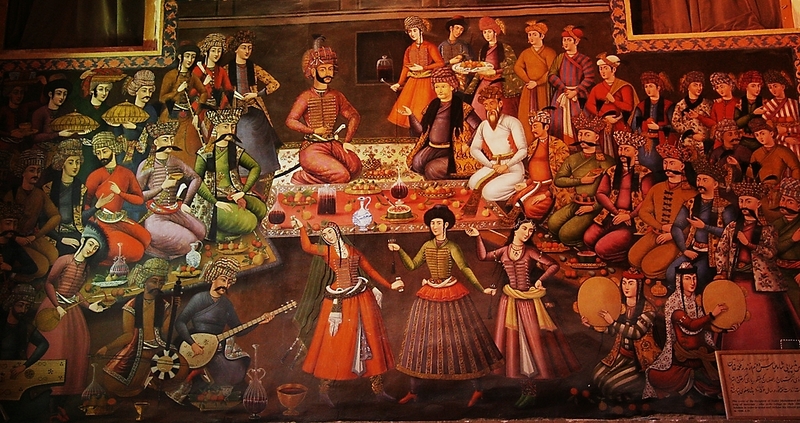 Iranian Circassians were coercively relocated to the Iranian plateau in the Safavid period and have since assimilated; although de Morgan reports a small, tight-knit community of Circassians in the village of Dez-e Kord near Aspas, Fars Province as late as the early 20th century. The Circassians of Iraq are now indistinguishable from other North Caucasian peoples there (Chechens, Ingush, Avars, Abkhazians, Lezgins, Kumyks) as none of these groups have retained their distinct languages or customs. However, Caucasian origins remain operative in the social memory in the form of surnames: al-Shishāni (literally “Chechen”), al-Kurji (“Georgian”), al-Sharkasi (“Circassian”), al-Dāghestāni (“Dagestanian”), etc. Libyan Circassians, primarily centered in Benghazi, have by and large lost their language and traditions, although their numbers could be as high as 100,000. Circassian youth dance troupes, from the diaspora communities of Jordan (left) and Turkey (right). A young Circassian in Maykop, capital of the Republic of Adyghea, Russia. In recent years the republic has experienced a deepening interest in the descendants of Circassian deportees abroad, often pleading to the diaspora to repopulate their historic homeland in light of upheavals in the Near East. In Turkey, Jordan, Syria, and Israel, the Circassian community is prolific; the youth participate actively in language and art schools where they are trained in Circassian music and dance. The first wave of Circassians in Jordan were mainly of Shapsug extraction, and took refuge in the old ruins of Amman in 1878; they were followed by Kabardians, Abzakh and Bzhedug, whose numbers today range between 20,000 and 100,000. The Prince Hamza Ibn al-Hussein Secondary School, a new Circassian school in Amman established with the support of the late King Hussein of Jordan, enrolls around 750 Jordanian Circassian students with the aim of preserving Circassian traditions while employing the Adyghe language (East Circassian) as a primary language of instruction alongside Arabic. The Syrian community could be as large as 130,000, while Turkey’s community of 130,000-2 million still does not hold the right to education and broadcasting in Circassian, but are currently following the Kurdish lead in these demands. National Circassian Language day among the descendants of the Russian deportees in Kfar Kama, Israel (in Circassian and Arabic). Jaimoukha, Amjad. The Circassians: A Handbook. Bulletin of the School of Oriental and African Studies, University of London Vol. 65, No. 1 (2002). Published by: Cambridge University Press. Manz, Beatrice; Haneda, Masashi. Čarkas. Encyclopedia Iranica. 1990. Richmond, Walter. The Northwest Caucasus: Past, Present, Future. Central Asian Studies. Routledge, 2008. The term for freemen, tfokotl, is a Russian rendering. The Adyghey is more precisely rendered as tlfoqotl’, with /tlf-/ ‘born’, /-qo-/ probaby ‘son’, and /tl’/ ‘man’. Ubykh has 81 consonants, which on my last trip to Istanbul I confirmed with the last speaker known to me (it is not yet totally dead). Thank you for your insightful commentary. While Russification of the original Adyghey term is indeed plausible, the forms “tfokotl” and “tlfoqotl’” may be dialectical variants of the same word; if the former indeed has currency in Russian sources, it may have been borrowed via contact with a dialectally distinct group. Alternatively, perhaps scholars publishing in English have simply not yet arrived at an orthographical convention for transliterating the vast inventory of Circassian phonemes into English (this could at least account for the k-q variation in English, although the form “tfokotl” seems to have higher incidence. Alternatively, the k-q variation could be attributed to Russification of a Circassian phoneme, as you suggest.) It would be interesting to encounter the term as attested in modern Kabardian, Adyghey, and Russian sources, in order to arrive at a more conclusive understanding of its etymology. Nevertheless, the etymology you provided has been duly noted and the article has been edited to reflect this. As we can expect, the Ubykh language featured dialectical variation in the number of distinct consonant sounds, as is characteristic of languages in the NWC family. The figure 80 provided reflects the number of native consonants (not including loanwords) attested to in the vernacular of Tevfik Esenc. If I may digress, the matter of your native Ubykh-speaking acquaintance in Istanbul eclipses any other discussion related to this article in importance by astronomical proportions! Such an individual would be of immeasurable value across the board to the academic community, and indeed to the continuity of the Ubykh nation. Our current understanding is that the Ubykh language has been extinct for nearly 23 years, inasmuch as all of the survivors of the ~50,000 Ubykh refugees displaced to the Ottoman Empire a century and a half ago had assimilated into the majority Turkish, Circassian or Abkhazian-speaking communities there by 1992. I suppose it is conceivable that there may indeed exist a few individuals in Turkey who are still familiar with the Ubykh language, but have elected to remain incognito for political or social reasons. After all, Mark Janse (Ghent) recently discovered a colony of several thousand third-generation Cappadocian Greek speakers in central and northern Greece (although with only imperfect command of the language), whereas the language was previously thought to be extinct following the population exchange between Greece and Turkey in the early 1920s. Of course this is speculation; I would be fascinated to hear more of your insights on this matter. Strange that the map has Abkhazia separated from the ‘Georgian Kingdoms’ , considering that Abkhazia was a ‘Georgian Kingdom’ since the XI century.